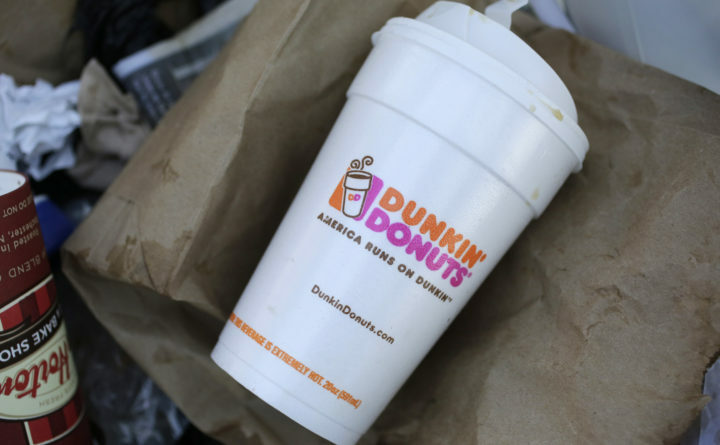 In this AP file photo, a Dunkin' Donuts' foam cup is discarded in a trash bin in New York. Dunkin Donuts was founded in Massachusetts and has always had strong ties to the region — Dunkin is arguably more New England than Starbucks is Seattle. Now, a New Englander has used the breakfast food chain’s polystyrene foam cups to catch waves after they’re done catching coffee. Korey Nolan — a Plymouth, Massachusetts, native who now lives in New Hampshire — made a surfboard using 700 disposable Dunkin’ cups, and the invention earned him a second-place finish in the international Creators & Inventors Upcycle Contest, The Boston Globe reported. Nolan said the surfboard is heavier than most, at 15 pounds, but that it’s buoyant. Nolan told the newspaper he also put a call out to friends and family to save their Dunkin cups and ended up with about 1,000. He said he has more than 200 left over from the build, in which he used bamboo stringers and a plant-based epoxy to stick the cups together into a single form. Sorry I haven’t made a post about this yet, I’ve been busy doing California stuff with my friends. Yesterday was wild. I finished 2nd in the @visslasurf & @surfrider creators contest, where I entered with a surfboard I hand built with 700 foam Dunkin’ Donuts, plastic straws, bamboo, and more. Since posting my entry, it has been shared by @boardporn, @noravexplora, several chapters of Surfrider, the feature of an @adventuresportsnetwork article and on @wreckedparis. That coupled with the overwhelming love and support of all of my friends, family, followers, and more have been more than I could imagine. This was only after I met @jamiethomas and rented his 1989 Land Cruiser for the day, saw the @zeroskateboards headquarters, surfed a beautiful hand crafted pig with the legendary @woodinsurfboards, saw my long lost good friend @illingworthr, and cruised the California coast. I’m super thankful to be out here spending time with @nickm_k and @chelsg89, whose lavatory autumnal soap game is very heavy. As much fun as I am having, I very much look forward to getting home to @bluepamplemousse and Marina. Thank you, Mumma, for letting me do this. For good measure, Nolan used plastic straws to make the surfboard’s fins. Both polystyrene foam and plastic straws — which are not biodegradable — have drawn the ire of environmentalists, and many communities around Maine have considered ordinances to ban polystyrene or reduce its use. And Dunkin’ itself won’t be able to supply Nolan’s upcycling projects much longer. The company has committed to fully transitioning away from polystyrene cups by 2020. For his part, Nolan said he’ll be happy when he can’t find enough foam cups to make another surfboard.